Hammer mills of all shapes and sizes process material with the same basic pulverizing action. Rectangular steel hammers are attached to a shaft inside of a steel grinding chamber. As the shaft spins, the hammers flail out bringing them into contact with the material being processed. 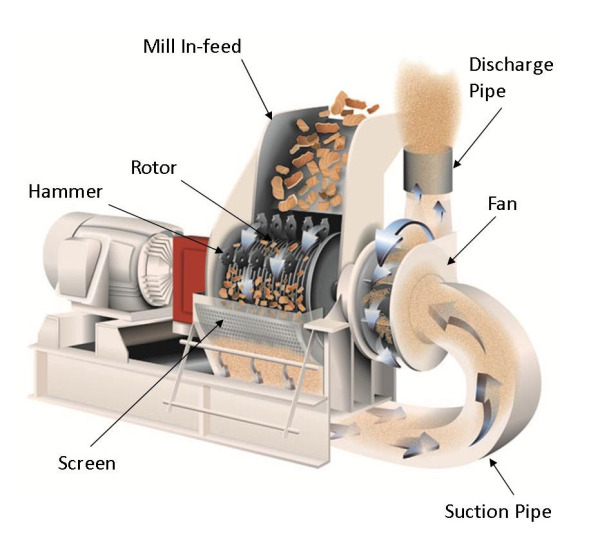 A combination of hammer blows, particle on particle impact, and contact with the mill’s interior work in unison to reduce the material until it is able to pass through the screen covering the mill’s discharge opening. It's all about the fan. Air swept mills are used primarily when grinding light, relatively non-abrasive materials to a mid range to fine particle size because lighter particles require suction to overcome the rotor airflow. The fan pulls the material from the mill in-feed through the grinding chamber. In addition, it pulls the finished product through the suction pipe, into the fan itself, and then blows the material out of the discharge pipe either to storage or next stage grinding. A properly designed pneumatic discharge system can increase production 300-400% over gravity dischage mills when grinding light materials to a fine particle size. Without air, dusty material will take the path of least resistance, typically out the feed chute. 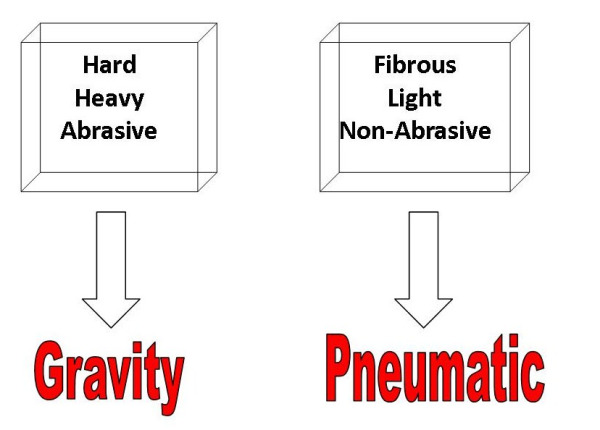 In a pneumatic system, dust is controlled and contained because all material is pulled in a common direction. The fan also aids in material transport to storage or next stage processing. The ability of the fan to pull the material through the screen allows for processing of materials with slightly higher moisture content than can be effectively processed via gravity discharge.